It began with an octopus; wandered into an accidental remark about “a flocking of Boyds”; and then drifted off somewhat sideways from there. 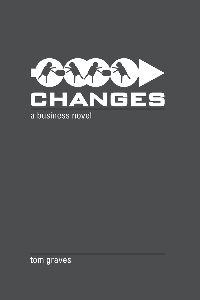 But seems that this crabwise shuffle may be leading somewhere useful – for my current explorations of sensemaking and the like, at any rate. The octopus bit was fairly straightforward, but hit like a bombshell. I’m currently reading Peter Godfrey-Smith’s ‘Other Minds: The octopus and the evolution of intelligent life‘, in which there’s a section in Chapter 2 where he’s talking about the evolution of cellular-level communication-mechanisms, leading to the development of the nervous-system. He points out that whilst most of the current scientific and other attention is still focussed on the action / sense / feedback loop of sensorimotor tasks, there’s another whole under-researched aspect of action-shaping tasks – the tasks to coordinate the action across the system as a whole. 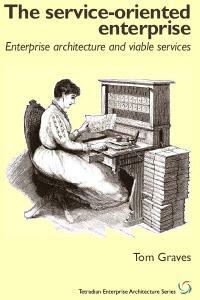 What I’m beginning to suspect is that there’s a third set of mechanisms at play that don’t yet seem to have been addressed much at all – about how intelligent entities drive their learning tasks, at both an individual and collective level. 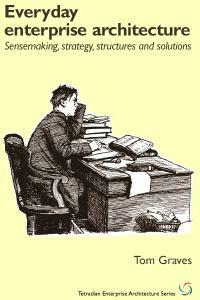 I’ll come back to that in a moment: I need to set some groundwork first. That does describe well the kind of feedforward/feedback-loop mechanisms for sensorimotor tasks, that apply at the individual level. 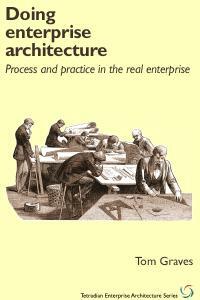 But where are the equivalent mechanisms for the action-shaping tasks – for coordination between entities? Thinking fractally, it’s clear there’s a sort-of equivalent of the SMDA loop at each level of collective action – but no description there of how the coordination to make those collective SMDA-loops actually happen, at any level. I have to admit it: right now that would seem to be a gaping hole in that model of mine. Or maybe not. This is where that note about “a flocking of Boyds” comes into the picture. 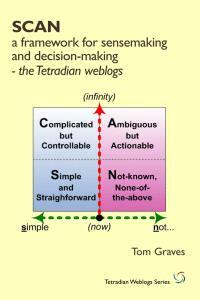 It was in a comment by Paul Beckford to an old post of mine, ‘More on principles and decision-time‘, from way back in January 2012. And even then it was actually an accidental pun: as he says in a later comment there, what he’d actually meant was “a flocking of boids”. Yet in practice both of those two terms are valid here: boid, as in a simple entity used in modelling of flocking or swarming behaviours; and Boyd, as the military theorist John Boyd – probably best known for the Observe / Orient / Decide / Act [OODA] model of sensemaking and decision-making, used particularly to describe contexts of real-time complexity. 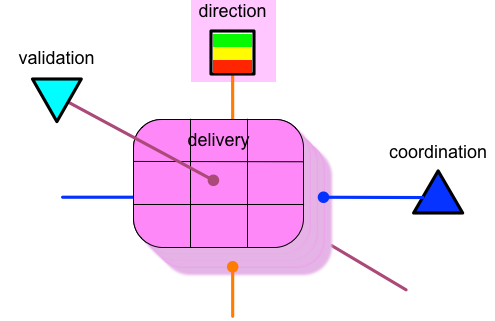 In that SCAN / SMDA diagram above, boids would sit over on the left-hand side of the space, with real-time decision-making in the Simple domain. The boids each follow simple rules, such as separation, a rule to steer to avoid crowding local flockmates; alignment, a rule to steer towards the average heading of local flockmates; and cohesion, a rule to steer to move toward the average position, or centre of mass, of local flockmates. This does explain basic flocking – a means to guide the inter-entity relationships within collective movement. Yet it doesn’t explain what drives the overall movement – such as in murmuration, where there is no distinct leader, yet still the evident presence of some kind of direction and purpose. Neither does it explain dynamic-leadership, such as in flight-patterns of geese, in which the V-pattern probably does arises from simple boid-like rules, but not the rotation of leadership as the leader of the migration tires and rotates back to a less strenuous position. Nor how, given that rotation of leadership, the group as a whole know how to navigate to a destination literally thousands of miles away, adjusting for weather and other hazards all the way along the journey. But on its own, even this doesn’t explain the process of collective decision-making and action. Boyd’s model describes what is primarily a solo dance – often in relationship and interaction with others, yes, yet still still essentially about the individual, not the collective as a whole. 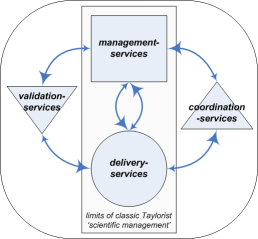 And whilst there is often no apparent ‘the Leader’, as in the grand hierarchies of Taylorism and the like, it’s clear there is leadership of some kind across the collective – yet Boyd’s model itself doesn’t really describe what that is. So with a flocking of boids, we’d have relationship, but no real sense of direction, other than reactive at best. 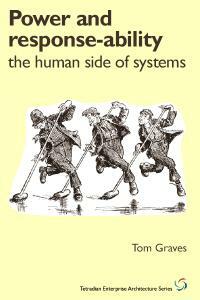 And with a flocking of Boyds, we could have a more proactive sensemaking and decision-making, yet little more than a ‘leadership’ of undirected anarchists – decision, yes, yet no apparent mechanism for shared decision-making or direction. In short, neither boids or Boyds would seem to provide us with a way to understand how collective-action actually works – nor, perhaps more important, to make it work better. 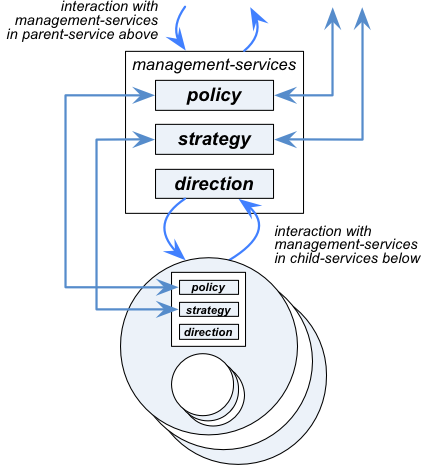 In this diagram, the dotted-line box around the central cluster of subsidiary-services, and the small circle just above it, represent the ‘system-1’ of Viable System Model – the ‘service-in-focus’ that does the ‘Decide’ and ‘Act’ parts of the Boyd model. 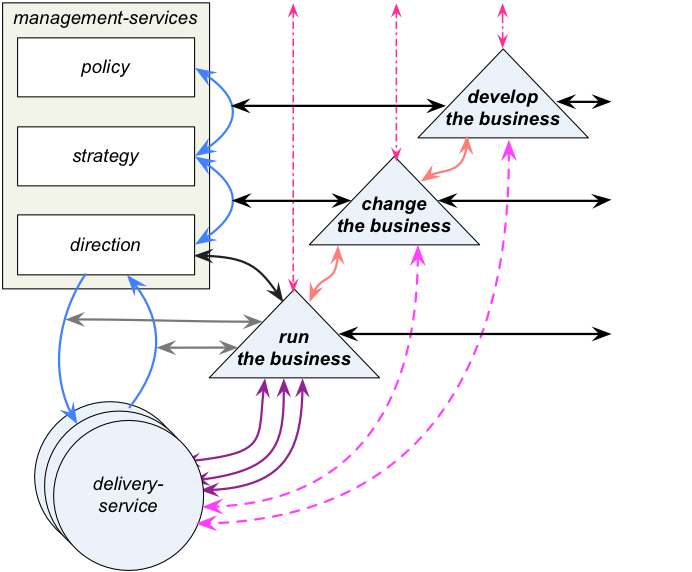 There are then all manner of service-interfaces to other services that inform the ‘Observe’ (sensing) and ‘Orient’ (sensemaking) parts of the Boyd model, represented in Enterprise Canvas by the arrowed-lines for flows of information and other exchanges, and by the ‘guidance-services’ – Direction-services, Coordination-services, and Validation-services. All of these guidance-services feed into the equivalent of the ‘Orient’ phase in Boyd’s model. The ‘Direction’ (‘system-3’) part provides the simple run-time rules that ‘a flocking of boids’ would require. 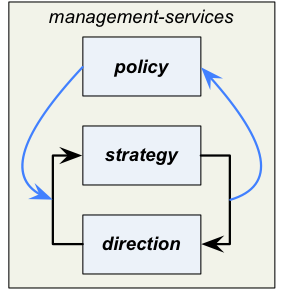 These are influenced in turn by the strategy and policy parts, which support some of the more complexity-capable sensemaking in ‘a flocking of Boyds’. 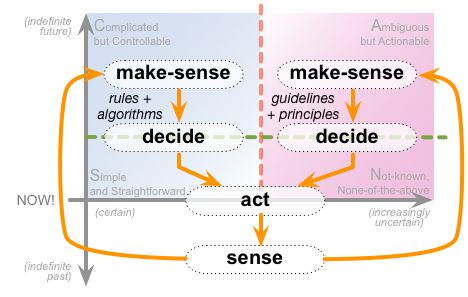 Put together, the connections to the outside world (OODA ‘Sense’), and between ‘system-1’ (OODA ‘Act’) and the recursive mesh of direction-services (as a simplified version of OODA ‘Orient’ and ‘Decide’), are perhaps enough to describe how sensorimotor tasks might work. Yet there’s nowhere near enough there to describe the mechanisms and links needed for action-shaping tasks or learning-tasks. 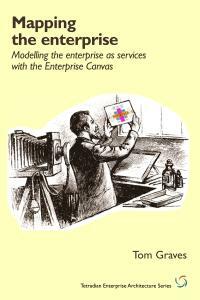 Which is where those other two clusters of services in Enterprise Canvas – Coordination and Validation – come into the picture. 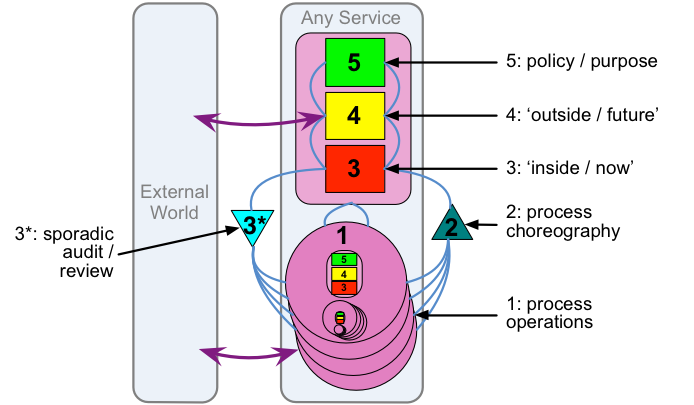 Again, these are fully recursive or fractal, weaving through the overall meshwork (‘horizontal’ connections) and hierarchies (‘vertical’ connections) of services. 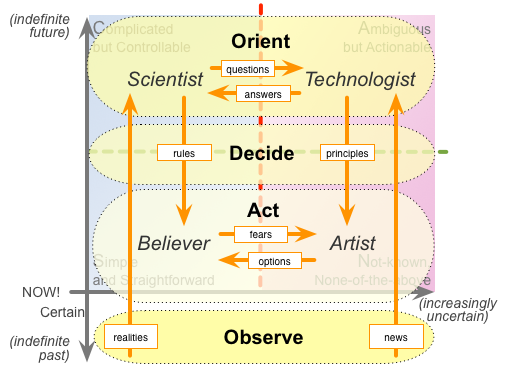 To crossmap to OODA, the Coordination-services represent much of what happens across the ‘feedforward’, ‘feedback’ and ‘implicit guidance and control’ flows shown in the OODA diagram. 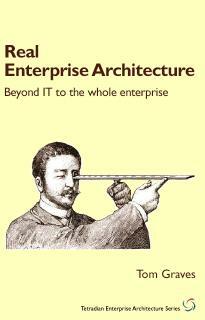 Unlike in OODA, though, these are not solely internal to the service-in-focus, but also coordinate between this and other services, to enable action-shaping across the collective whole. The Validation-services support how strategy and values pervade throughout all services – in effect feeding into the equivalents of the ‘Cultural Traditions’, ‘Genetic Heritage’ and (aspects of) the ‘Analyses & Syntheses’ elements within the OODA ‘Orient’ processes. 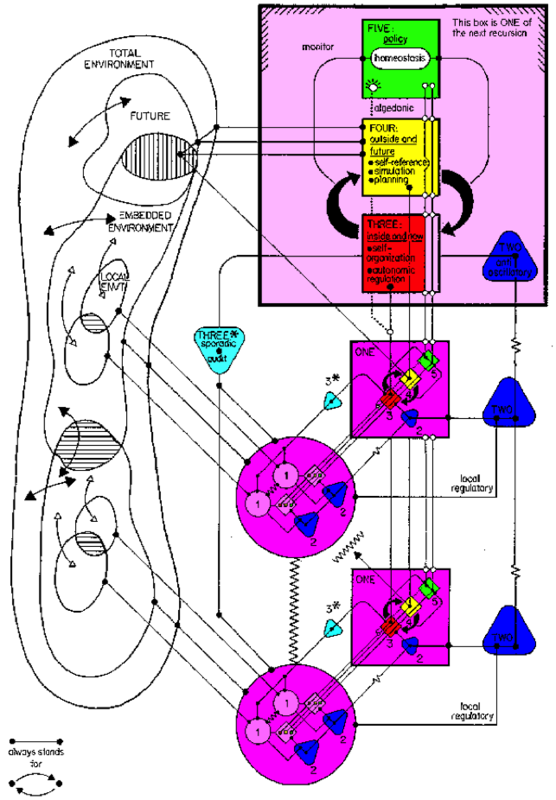 As with the Coordination services, this supports collective action-shaping tasks, though the mechanisms are much slower – analogous with the limbic-system, rather than the faster nervous-system, within an animal body. 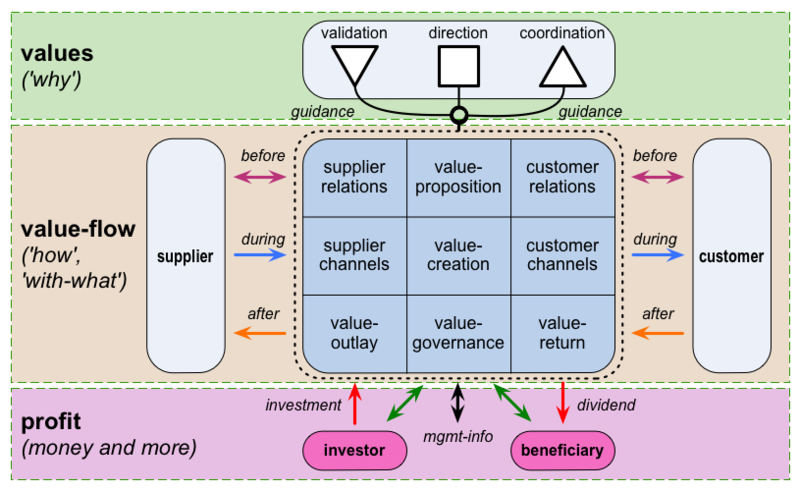 There are also distinct sets of services for each of the core values or concerns that apply to the broader collective: for example, for a commercial business, there would need to be distinct sets of Validation-services for security, health-and-safety, financial-probity, business-ethics, product-quality, environment and so on, along with industry-standards and regulatory-compliance – in short, any concern that is everyone’s responsibility. That last subset of activities are what support learning-tasks, for the individual, and, in combination with the Coordination-services, for the broader collective. Worth exploring further, I’d hope? Over to you for comments and suchlike, anyway. 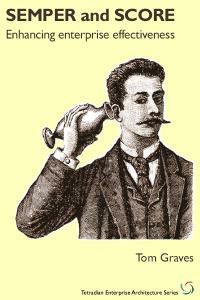 Hi Tom – I thought I’d make a link over to some thoughts that started with Beer’s homeostatis. I’d love to do some further work on this stuff, with you, in the presence of funding! Thanks, Doug. I’ve had a quick glance at your post – looks good! 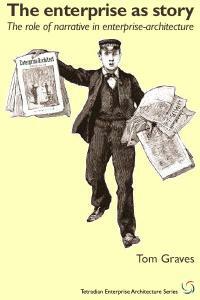 – but I have to rush off to a meeting so don’t have time right now to read properly, will need to do so later. Will come back here with comments. But yeah, let’s make it happen somehow, anyway? 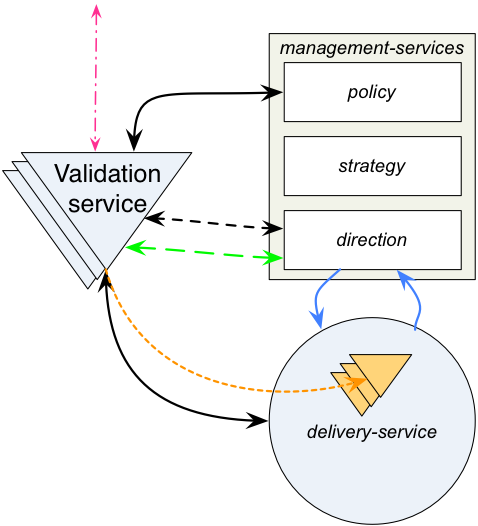 I recall in one of our previous discussions i was rambling on about the VSM and useful extensions which could potentially be useful in import/export of architecture frameworks into broader contexts quite easily.. Apologies but i only remembered this when I saw the VSM again in this post! 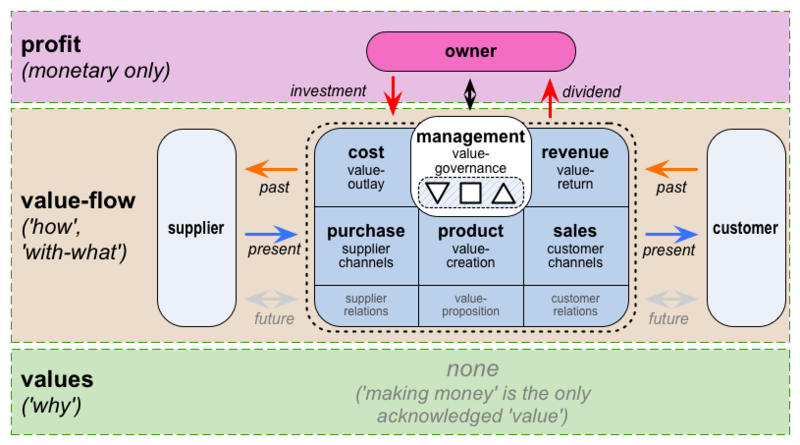 Here is a link to wiki overview of “Viable Systems Theory” which essentially frames an explicit perspective in contrast to the implicit perspective of the VSM. 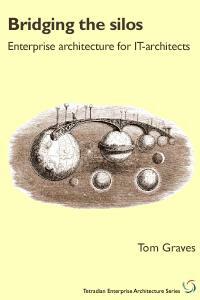 Expression of concepts in both the implicit and explicit modes could provide useful insights in all applications.. 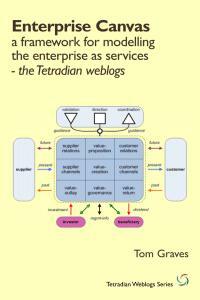 This model has been further extended in the Social, Cultural, and Meta-Narrative fields found in the following links..